We have updated our HPC Pricing Guide to give you an understanding of the kind of HPC cluster you can buy within three budget ranges – $150,000, $250,000 and $500,000. 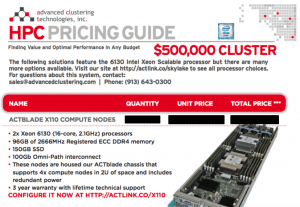 Advanced Clustering’s new HPC Pricing Guide provides you with insights about the optimal HPC cluster featuring the latest HPC technology including the latest generation Intel Xeon Scalable processors (codename “Skylake”). These processors deliver advanced performance with up to 28 cores and significant increases in memory and I/O bandwidth (with six memory channels and 48 PCIe lanes) to handle extremely large compute- and data-intensive workloads. Download your free copy of the HPC Pricing Guide today. Copyright © 2019. Advanced Clustering Technologies. All Rights Reserved.